When America sneezes, it is said, Britain catches a cold. 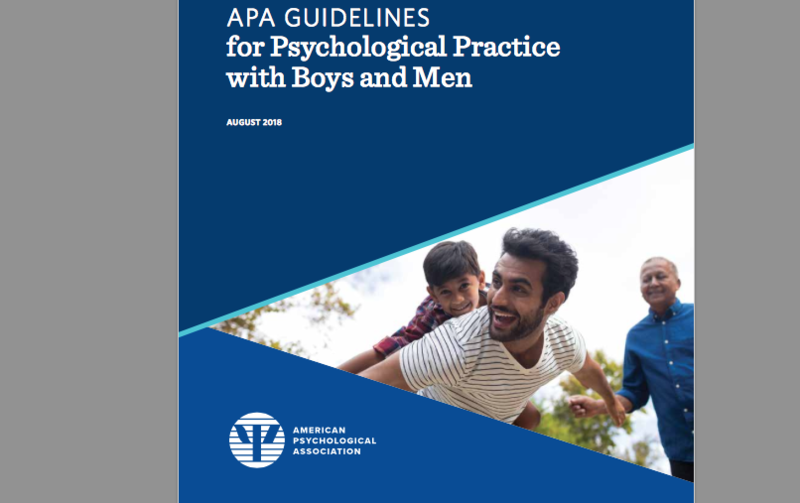 I write to alert colleagues to a guideline from the American Psychological Association for the Psychological Practice with Boys and Men, in the hope our own organisation avoid adopting the crude application of critical gender theory to the clinical needs of males. The stated purpose of the guideline is to ‘enhance gender- and culture-sensitive psychological practice with boys and men’. The problem with men and the answer to male problems is, according to the APA, concerned with what they call ‘traditional masculine ideology’, a ‘constellation of standards that have held sway over large segments of the population, including anti-femininity, achievement, eschewal of the appearance of weakness, and adventure, risk and violence’. This odd collection of symptoms implies that achievement and a spirit of adventure is pathological and synonymous with violence. Past, present and elected presidents of Division 51 of the APA, The Society for the Psychological Study of Men and Masculinity, responded to criticism of the guideline by elucidating that it is ‘the extreme stereotypical behaviors – not simply being male or a “traditional male” – that may result in negative outcomes’, yet such clarity is nowhere to be seen in the Guideline itself. We usually think of women as being on the wrong side of gender inequality, but when it comes to health and educational performance at least, the reality is quite the reverse. Infant mortality is highest in boys and males are at greater risk of premature death right from conception to old age. Men are constitutionally vulnerable to almost everything that is life threatening. Across the world, boys are much less likely to reach standards of proficiency in reading, maths and science. Criminality and suicide are an almost exclusively male preserve. ‘Being male’, says Randolph Nesse, ‘is the single largest demographic factor for early death’. The necessity for considering the clinical needs of males is clear and this point is acknowledged by the guideline. However, what is startling is that the APA go on to attribute these excessively unfavourable statistics to an ideology: ‘Traditional masculinity – marked by stoicism, competitiveness, dominance and aggression – is, on the whole, harmful’. This, in my view, is ‘Me-Too’ gone rogue. It undermines the movement conceived to confront tyranny and becomes a tyranny of its own. Partisan, dogmatic ideology replaces therapy; the clinical role implicit is that of psychologist as indoctrinator rather than therapist. The APA completely misses the clinical wood for the political trees. I hope our own Society can avoid this worrying trend; that of the infiltration of the discipline of psychology by critical gender theory, where everything is attributable to social construction and nothing is rooted in nature, where we all become the same – ‘When researchers strip away stereotypes’, declares the guideline, ‘there isn’t much difference in the basic behaviours of men and women’. The ills of men are attributed to the particular social construction of masculinity, which is apparently rooted in ‘patriarchy’ and ‘white supremacy’, and political re-education is the designated cure. There is complete confusion between ‘Traditional Masculine Ideology’ and Toxic Masculinity, a term I would endorse. It is noteworthy that testosterone does not get a mention in the report. My clinical and research experience in treating men who suffer and cause suffering to others is that their misuse of power is not due to being on the receiving end of the transmission of a distorted ideology, it is a consequence of being the victims of abuse and neglect. This can cause boys to identify themselves with the aggressor and evacuate the unbearable feelings of weakness and vulnerability associated with victimhood into the other. Hence the correct line of treatment is to address these personal and interpersonal dynamics, rather than subject men to ideological thought control designed to restrict and expel impulses; to guilt men into submission. In the film The Third Man, one of the protagonists, Harry Lime, declares, ‘…In Italy for 30 years under the Borges they had warfare, terror, murder, bloodshed, but they produced Michelangelo, Leonardo da Vinci and the Renaissance. In Switzerland they had brotherly love. They had 500 years of democracy and peace, and what did that produce? The cuckoo clock’. The APA would have us live in this kind of sterile, grey, lifeless world in which men are pacified, submissive, emasculated. Supervision of our thinking results in a restricted, constricted existence which undermines something more life affirming, a world in which we can celebrate equality with difference. The reprobate male, the anti-conformist adventurer, provides just this, an antidote to a masculinity policed by a right-on ideology which throttles spontaneity and creativity. It is hard enough to engage men and boys in addressing the psychological obstacles which inhibit life and cause harm to self and others. I fear that this guideline will only serve to alienate half the species, some of whom are in desperate need of our help.